Weizenberg wrote: In the early days i spent a lot of time translating texts from Narziß to the group in live chats. There was a section in "Abriss" where it was mentioned that more than 10mgl of potassium is not desirable in the wort. It was from that moment on where everyone started switching to NaMeta. An admittedly very late response to this comment. Anyone has more info on this? The Brewer's Handbook from Goldammer (Google search, I do not own the book) has the similar information, probably from the same source but expands that the issue is inhibition of "some" enzymes. The problem is that potassium concentration in the mash can be anywhere from 100mg/L to 500 mg/L (all coming from malted barley) per textbooks so how an extra 10 mg/L can have an effect is not clear. 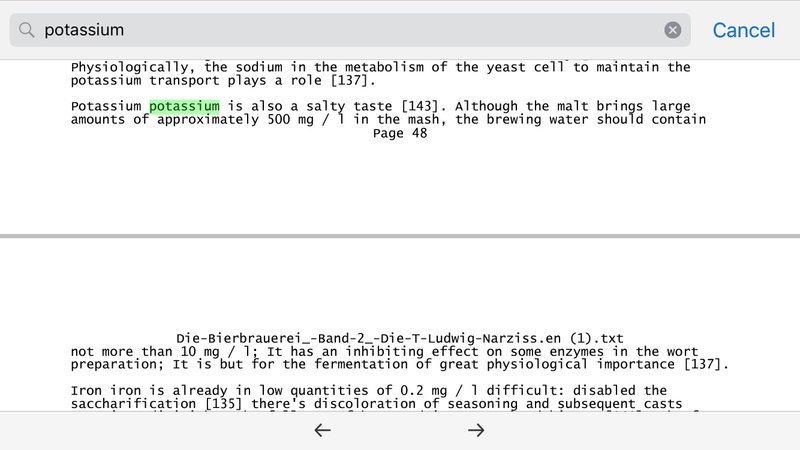 It is possible that the referred enzymes are peptidases, and the context of the comment is that as little as 10mg/L can inhibit them; trying to make the point that these enzymes are not likely to be active in the mash given that potassium concentration will be much higher than 10mg/L but I would need to reach the source. My current dose of SBT is 0.25 g/gal which gives ~10.4 ppm K and equates to a 30 ppm KMeta dose. I'm going to 10-15 ppm over the next few sessions so the K amount will drop accordingly. The bad part about relying on SBT is that you can't shrink your sulfite dose without also shrinking your tannin dose. The way we use SMB/AA and gallotannin, they fulfill completely different purposes - the gallotannin is largely there to shut down the catalytic oxidation pathway by chelating metals, whereas the SMB/AA (+degassing) is there to inhibit the enzymatic pathway because we don't have a targeted way of denaturing polyphenol oxidase, LOX, peroxidase, etc. without causing collateral damage, i.e. denaturing the amylase enzymes as well. Techbrau wrote: The bad part about relying on SBT is that you can't shrink your sulfite dose without also shrinking your tannin dose. The way we use SMB/AA and gallotannin, they fulfill completely different purposes - the gallotannin is largely there to shut down the catalytic oxidation pathway by chelating metals, whereas the SMB/AA (+degassing) is there to inhibit the enzymatic pathway because we don't have a targeted way of denaturing polyphenol oxidase, LOX, peroxidase, etc. without causing collateral damage, i.e. denaturing the amylase enzymes as well. I should note that as the SBT dose has decreased we've been adding back a targeted amount of BTB separately to compensate for the reduction. EDIT: Also, the good thing about our spreadsheet is it supports either SBT or custom blending. We stock all the constituent parts as well as SBT and the blend table allows for any combinations of percentages of NaMeta, AA, and BTB or you can set it to 45/45/10 for SBT. I agree that flexibility is required especially as you try to eliminate metabisulfite altogether, which is a reality.